This is India’s first ever electric sedan and it is called Mahindra e-Verito electric. Although there are many brands who have shown their concepts, they are still left behind in launching a proper electric sedan in India. Mahindra, India’s leading SUV manufacturer has been showcasing its e-Verito on several occasions starting from 2014 Auto Expo as well as 2016 Auto Expo. Mahindra is developing the electric version of Verito, since it acquired the Reva brand. After e2o, Mahindra e-Verito sedan is going to be a major product for its Reva portfolio. 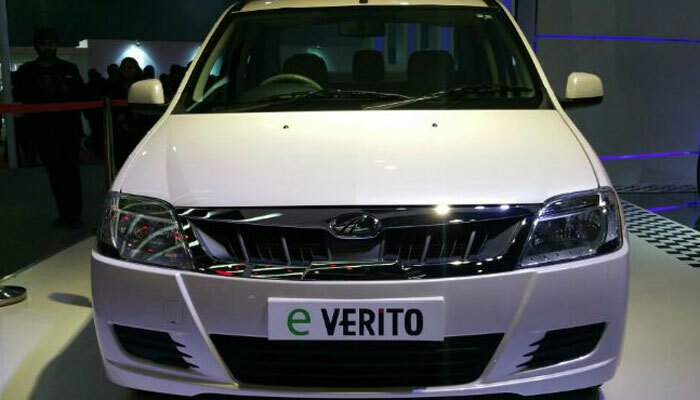 You can expect an increase in the range of the e-Verito when compared to that of Mahindra e2O. Mahindra Verito would be atleast having a range of 100 Kms on charging once. This should be the prime USP for Mahindra to sell e-Virota in good numbers. The all new e-Verito is powered by 72V 3-phase AC induction engine that churns out 41bhp of power at 3500rpm and delivers a torque of 91Nm at 3000rpm. The engine of e-Verito will be mated to an automatic transmission gearbox. The car will be additionally getting the Eco mode and also a battery boost too. The e-Verito sedan will have remote diagnostics and real time and immediate roadside assistance ( RSA) as well. Mahindra e-Verito’s interiors are filled with all the tech savvy things. There is going to be appropriate gadget for telling the amount of battery left, etc and is going to come with host of connectivity features. There is also going to be a touchscreen infotainment system that adds more tech-savvy-ness to the car. When it comes to seating capacity, the e-Verito can easily accomodate 5 people in comfort. The expected price of Mahindra e-Verito is between INR 7 Lakhs to 8 Lakhs. Let us know, what you think about Verito by commenting below.